Tis the season for squash! Many recipes call for sugar, when cooking acorn squash. No need to add sugar to this already sweet dish. Here is an easy, breezy acorn squash dish that will make you look like a professional (and keep it healthy). Head to your local farmers market and grab an acorn squash before they close down for the season. Health Tip: Adding in sweet veggies can help you crowd out sugary foods like refined carbohydrates (white carbs) and sugary snacks. Don’t just take my word for it, try it yourself! Add in sweet potatoes, squash, beets & carrots and see how your sugar cravings react. Let me know how it goes in the comments below! 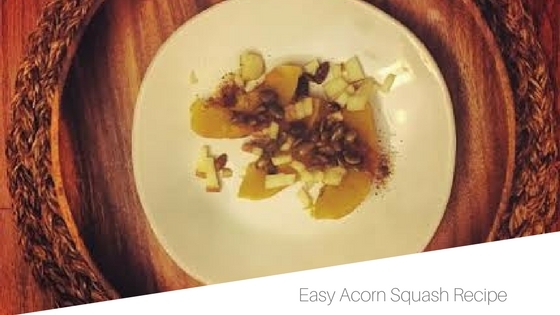 Did you need dessert after this easy acorn squash dish? 1. Preheat oven to 350, place whole acorn squash in oven and bake for 30 mins, or until tender. 2. When acorn squash is done, cut in half, remove seeds and skin, then slice into pieces. 3. Toast pumpkin seeds, on medium heat. 4. Dice garlic & apple 5. Top acorn squash with cinnamon, nutmeg, vanilla, apple, garlic, olive oil, raisins, salt & pepper. 6. Serve mixed all together or in slices. It looks pretty in slices but is more functional mixed. Who are you eating with, make your decision from there!